I'll Take What She Has offers a fun, and often irreverent tongue-in-cheek look at friendship between women and women's issues. Nora is an accomplished teacher but she often finds herself lacking, especially when it comes to having a child. Her biological clock isn't ticking it's resounding like the bass-line in a heavy metal song. Annie is a devoted mother and loves her partner, but often looks at other women without children and feels she's being left behind. Both Nora and Annie find it difficult to not be jealous of Cynthia, a new teacher on the school's campus. Cynthia has traveled the world, appears to have a sixth-sense about what is and isn't fashionable, has a beautiful singing voice, grows her own herbs to make her own teas, and has managed to marry the most eligible man on campus. If that wasn't bad enough Cynthia has also managed to commandeer the apartment that was promised to Annie and talk her husband into having a child (which is heartbreaking to Nora because when she was dating him he said he didn't want children . . . ever, thus the reason for their breakup). 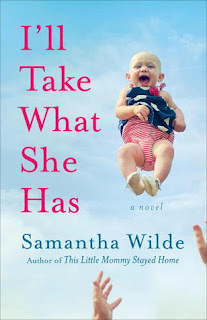 I found I'll Take What She Has to be a relatively fast-paced read and I rather enjoyed the humorous dialogue and situations. However, there was just something about this story that didn't connect with me and I can't really say what it was. Ms. Wilde has provided characters that are well developed and likeable (even the dreaded Cynthia). The action and back-story are well presented and believable. Yet even with all of this by the time I was halfway through the story I simply lost interest and had to force myself to read to the end. My lack of interest could have been due to external factors or presumably a reader's slump, but I found it quite easy to get involved with other books immediately after reading this one so I can't say for sure. Although I didn't connect with I'll Take What She Has, if you enjoy light-hearted, humorous contemporary fiction, then this may be just the story for you.